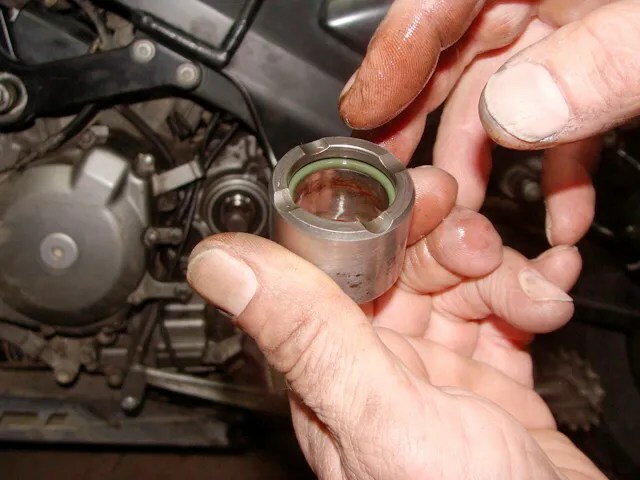 During the latter part of the 2009 riding season, the clutch push rod seal of my motorcycle began leaking. I was not ready to tackle replacing the seal, so a little online research gave me a “quick fix” to hold me until I was ready to tackle this job. 1- Remove the clutch release mechanism. 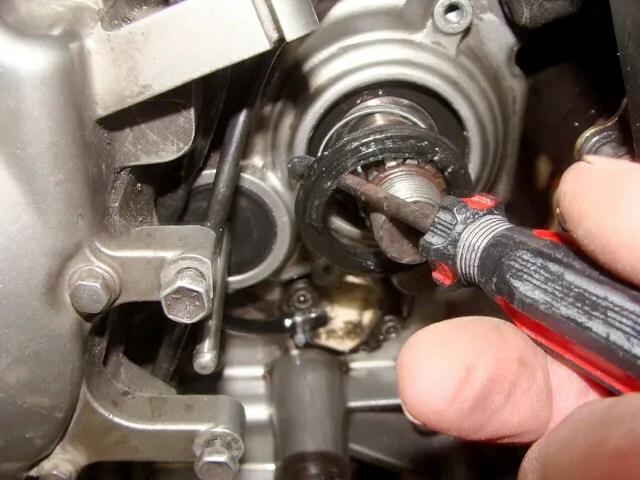 2- Pull the clutch push rod out of the motor. 3- Squirt a little high quality grease through the push rod hole in the seal. It worked! Eventually though, I knew that I needed to replace the clutch push rod seal, clutch push rod, and a worn clutch release mechanism. 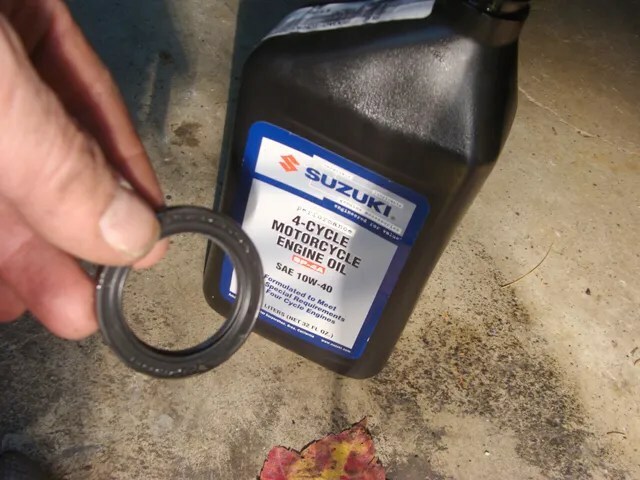 And, I figured that if I was going to take the time to replace the clutch push rod oil seal, I might as well replace the countershaft seal, and the sprocket spacer o-ring, while I was right there. At the point that I did this job, my motorcycle had 62,441 miles on it. This was not a really difficult job to do. However, there is one bolt that I did not have the right tool for. I couldn’t get the bolt loose with the tools that I owned, so I ended up fabricating a special wrench to get at this bolt. 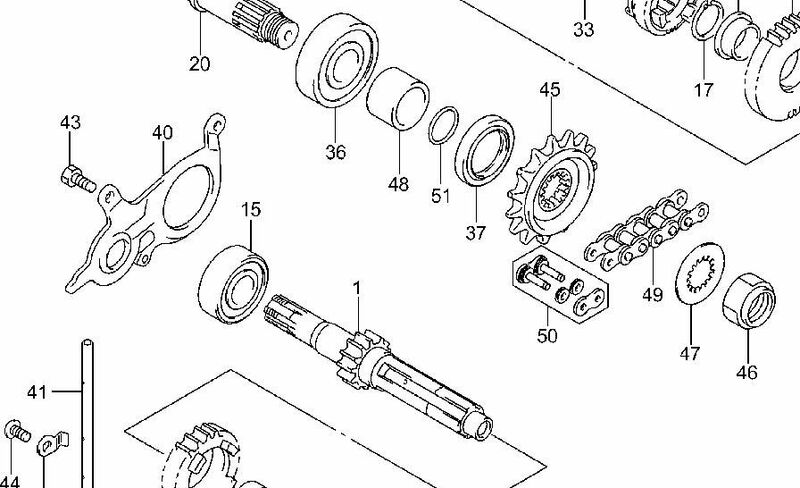 The parts that I will be referring to can be viewed in the below diagrams. #15 = Clutch Push Rod. 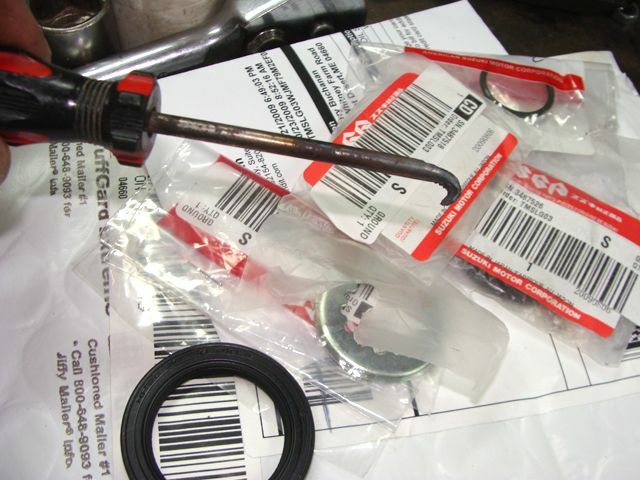 #23 = Clutch Push Rod Seal. 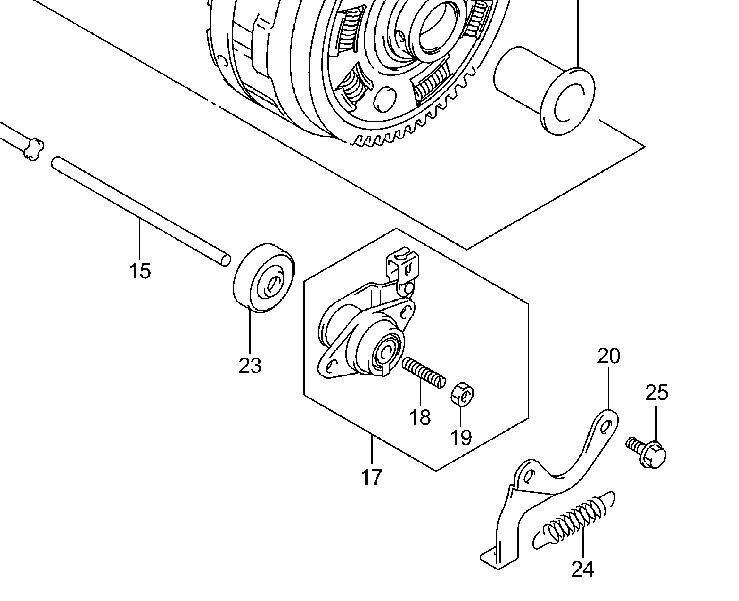 #17 = Clutch Release Mechanism. #51 = Sprocket Spacer O-Ring. 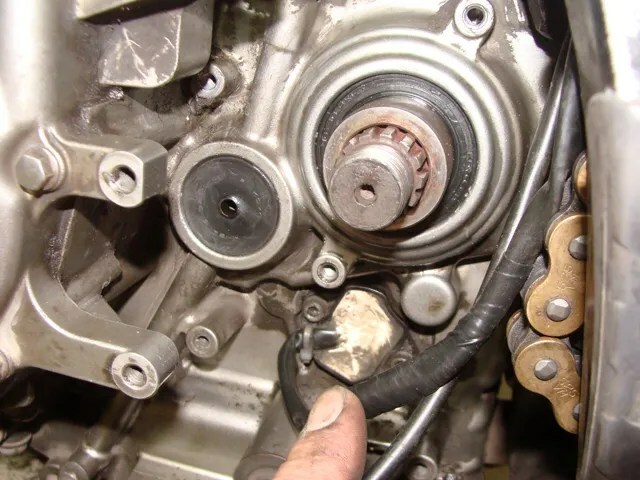 To get at the area of the motor, where the work needed to be done, I had to remove the countersprocket from the motor’s countershaft. This is where I started the job; mapping out my steps forward below. 1- I placed the transmission in neutral. 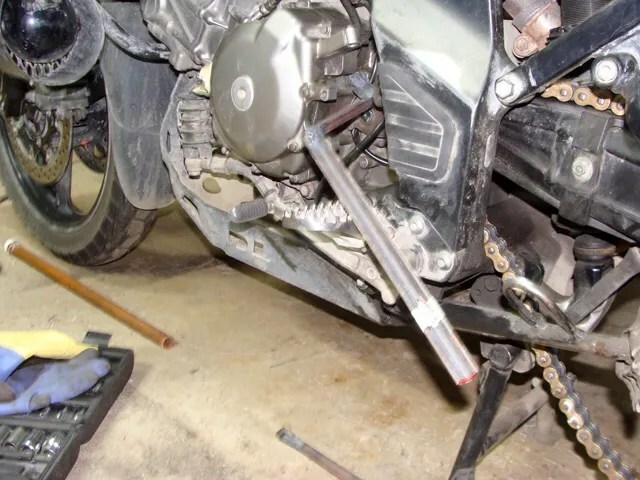 2- Then, I rolled the motorcycle up on to its centerstand..
4- Next, I removed the clutch release mechanism. 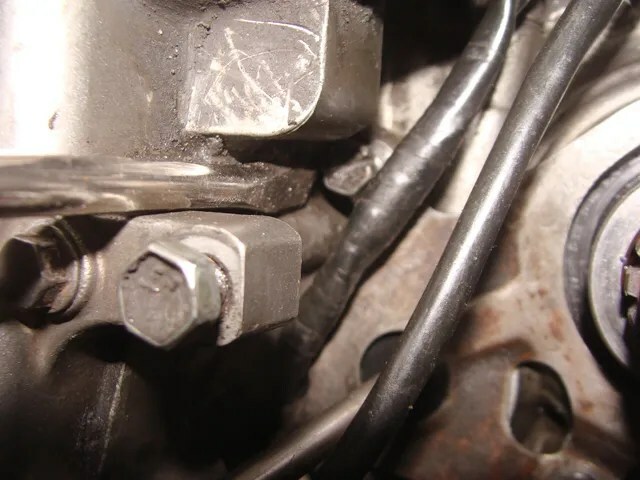 4a- Using 10mm and 12mm open end wrenches, I unscrewed the clutch cable adjusting lock nut all the way off of its threads, (this is the bottom most nut on the clutch cable.). The 10mm wrench is used on the cable sheathing to keep it from spinning. I used the 12mm wrench to loosen and remove the lock nut at the bottom end of the threaded adjuster. 4b- Next, I loosened the two 10mm bolts that hold the clutch release mechanism to the motor bracket. Wrapping my fingers around the release mechanism, (to keep it from falling apart), I pulled the clutch cable and the threaded adjuster up out of its bracket. I taped all of parts of the clutch release mechanism together, and then draped it out of the work area. 5- Using my fingers, I pulled the clutch push rod out of the motor. This was kind of cool to do! 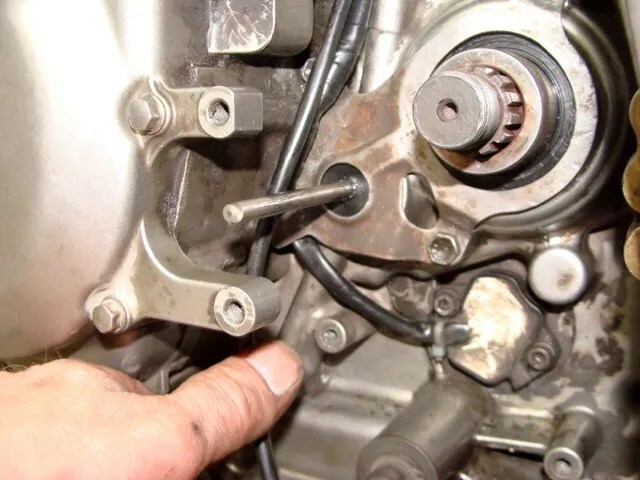 I am pointing to the clutch pushrod in the photograph below. Next, I focused on removing the countersprocket nut. 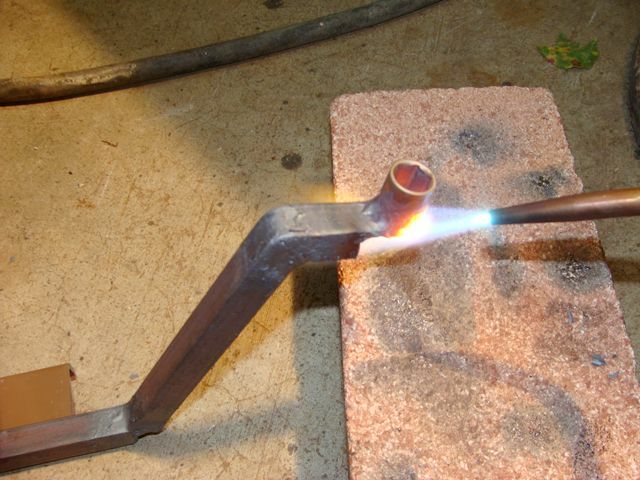 6- I used a piece of metal tubing that I slide across both sides of my swingarm, and through the rear wheel. I rotated the rear wheel so that, one of the wheel’s spokes fetched up against the steel tubing to prevent the wheel from turning when I loosened the countersprocket nut. 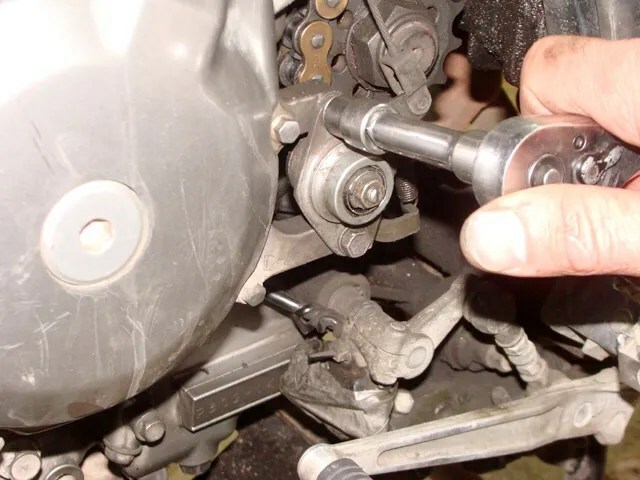 7- Using a hammer and the flat blade of a screwdriver, I lightly tapped and bent upright, the bent down portion of the lock washer that is folded down on to one face of the countersprocket nut. The washer is made of relatively soft metal. It bent fairly easily. 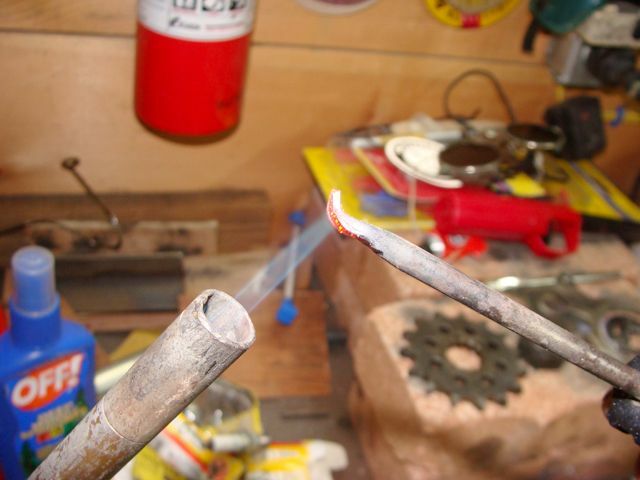 8- I used a propane torch to heat up the countershaft nut. 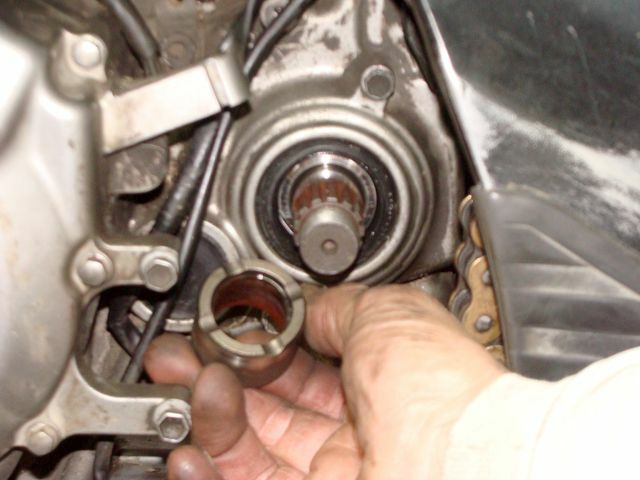 Suzuki uses a “red” thread-locker during the OEM installation of the countershaft nut. It’s tough stuff! During re-installation, I planned on using a “blue” thread-locker. 8a- I heated up the countersprocket nut. 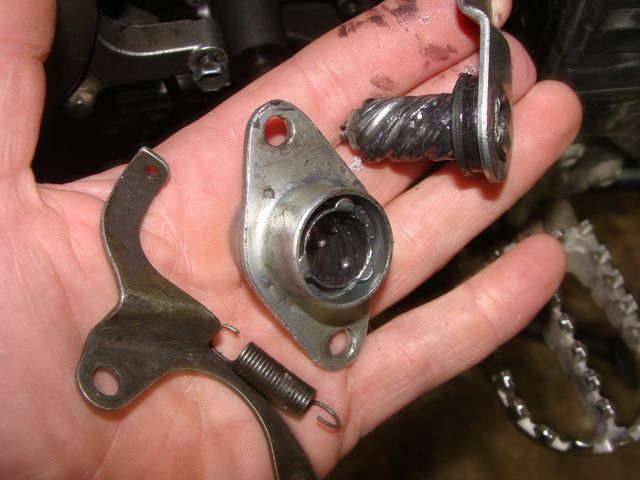 9- I loosened the rear wheel axel, and the chain adjusters at either ends of the swingarm. 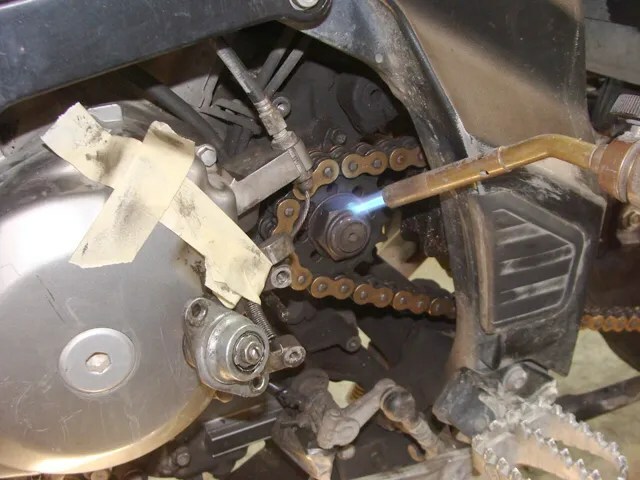 Doing this will make it easier to remove and reinstall the drive chain and the countersprocket. 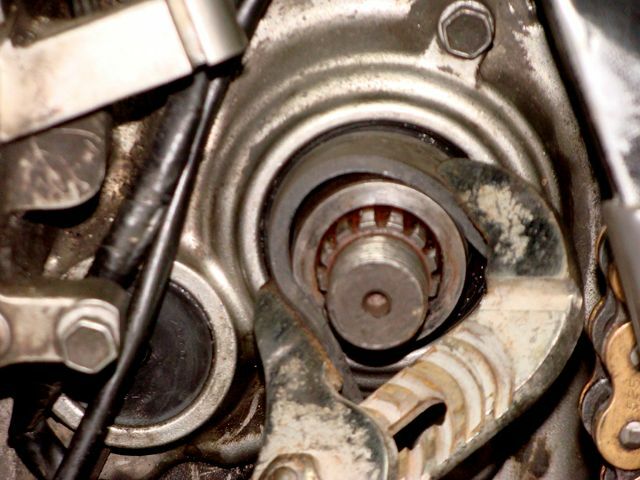 10- Next, I removed the lock washer, countersprocket and chain by sliding it off of the countershaft. I draped the chain over the swingarm and “benched” the countersprocket, lock washer and countershaft nut, so as not to lose them! 11- The photograph below illustrates what the seal retainer plate looks like; the part that needs to be removed next. There are three, 10mm bolts that are holding the plate in place. Before I removed it, I made a note of how the kickstand safety switch wire and the gear indicator wire were routed. The gear indicator wire is led behind the “ear” of the seal retainer plate. The two aft, “exposed” bolts to the seal retainer plate are very easy to remove. The forward one, that is located above the “ear” on the seal retainer, was very difficult for me to remove and reinstall. A 1/4″ drive, 10mm socket will fit on to the bolt. 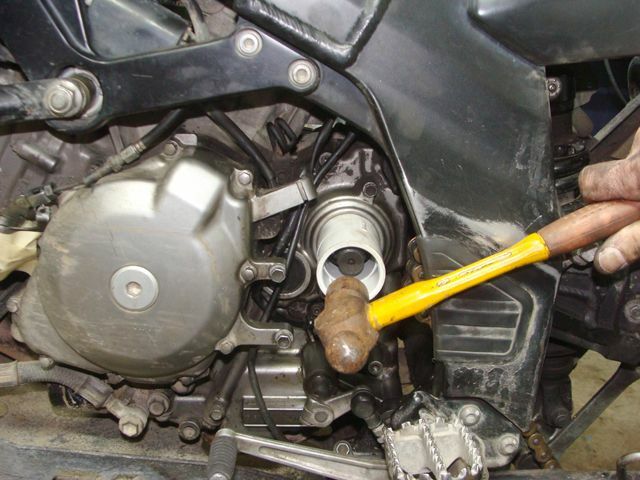 But, there is not enough space to also fit a ratchet on to the socket to remove the bolt. 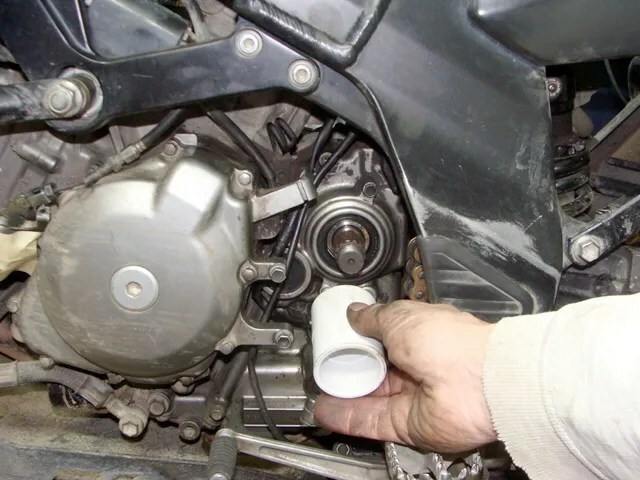 A 3/8″ drive, 10mm socket is too large of a diameter, plus there is still the issue of not enough space for a ratchet. I could slide the “open end” of a mechanic’s wrench on to the bolt, but I could not get enough leverage to turn it in the tight quarters. The “closed” end of the wrench was like the 3/8″ drive socket, there wasn’t enough clearance room. 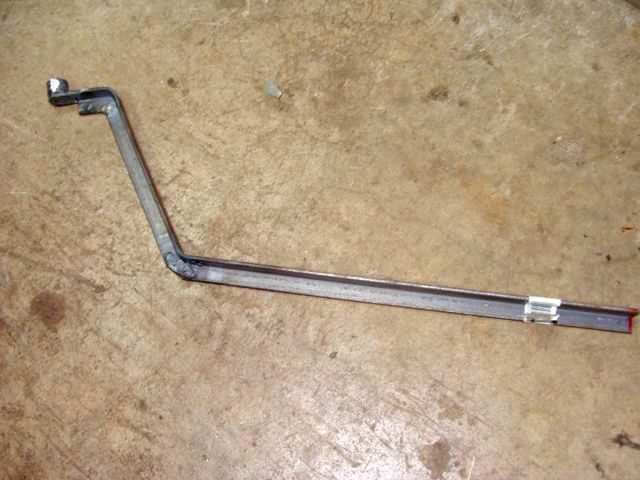 Finally, out of frustration, I made my own wrench! I borrowed my landlord’s truck and I drove to my local Napa store and purchased a cheap 10mm, 1/4″ drive socket. Back home, I cut the socket in half, “height-wise” with a hacksaw, and welded it to some scrap, angle steel that I fabricated as a handle. My homemade wrench worked like a charm! With the seal retainer plate removed, I was now able to remove the clutch push rod seal. Here again, I didn’t have a proper tool, so I modified an old, flat-blade screwdriver into a “seal remover tool”. I formed a “hook” out of the blade by heating it up red hot and twisting it with my Leatherman, needle nose pliers. 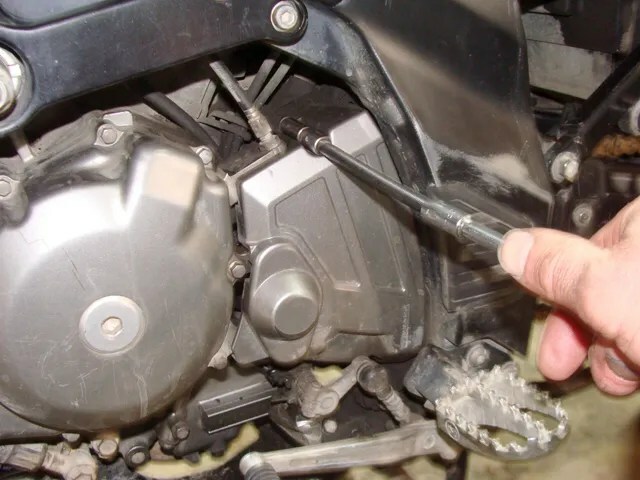 12- Using my seal remover tool, I reached through the clutch push rod hole and began to pull, (I had to be careful not to pull the motorcycle over on top of me!). I learned that I can’t get the seal in one yank. It took several attempts to get the seal out of the motor. I shifted the seal removal tool around to different locations and applied pressure to the seal by pulling it towards me. The seal eventually “popped” out. 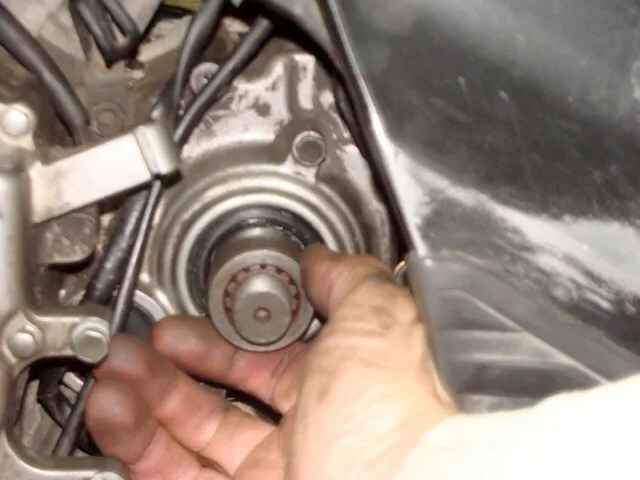 13- While I was right there, I installed the new clutch pushrod seal. 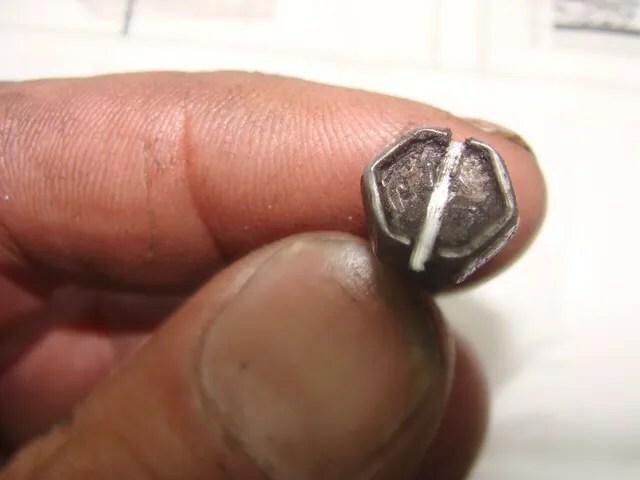 At the bottom of the opening where the seal fits into the motor, there is a small “weep hole” for motor oil to pass through. If the push rod seal is seated too far into its opening, the “weep hole” will be blocked. Oil will leak out of the seal if the seal is seated too far in; blocking off this hole. 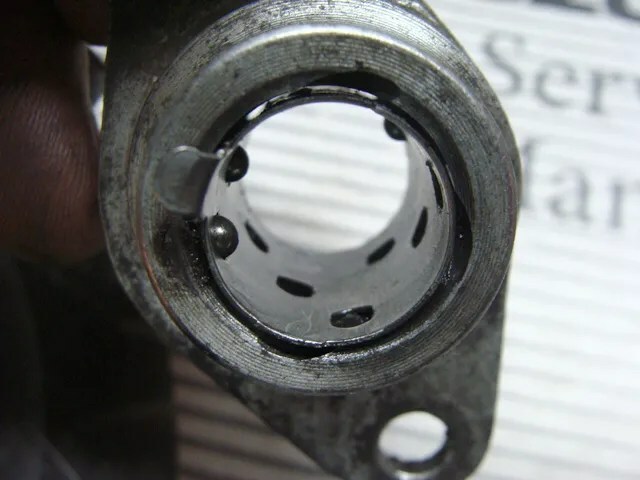 The exposed face of the clutch push rod seal must be installed “flush” with the face of the seal opening. Now, it was time for me to move on to the countershaft seal and the sprocket spacer o-ring. 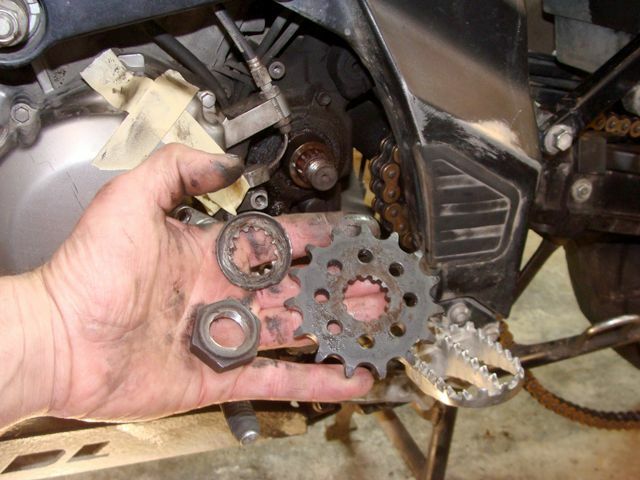 14- First, I removed the sprocket spacer. I wrapped a strip of rubber around the spacer, to protect the surface, from marring it with a pair of channel-lock pliers. The action that I used to remove the spacer was to “twist, counterclockwise” while pulling towards me with the pliers. Once the spacer started to slide, it pulled easily. When I got the spacer out towards the countershaft splines, I was able to remove the spacer from the shaft with my fingers. The sprocket spacer was pretty grungy, so I cleaned it up with some Scotchbrite. 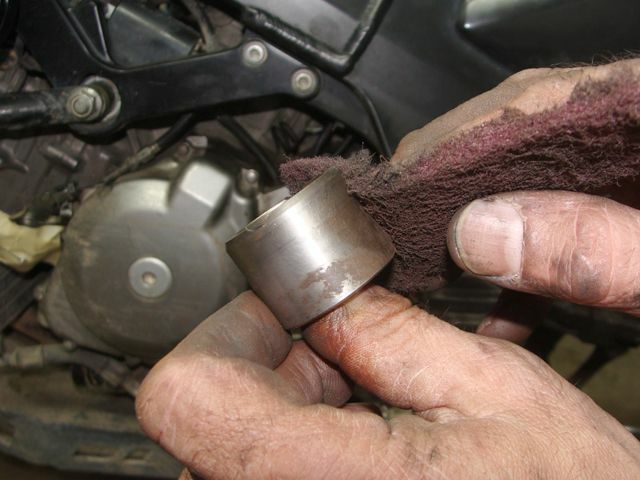 15- Next, I used my seal remover tool that I made for my push rod seal to remove the countershaft seal. I had to move the location of the tool and pull, several times to free up the seal. 16- When I installed the new seal, I lightly coated the seal with fresh motor oil. 17- I used a 2″ PVC coupling joint as my “seal driver”. I did part of the job very cautiously. I tapped once; checked. Tapped again; checked. I had to “tilt” the PVC adaptor, and tap “locally” a few times at different locations because the seal started to install crooked. The final resting place of the seal was just inside from the radius of the seal opening. 18- I removed the old o-ring from inside the sprocket spacer. I had to clean out the o-ring groove of crud. I used a rag and the end of a welding rod. While doing this, I was very, very careful that I didn’t mar the groove surface. It would cause an oil leak if I did scratch it. Then, I lightly coated the new o-ring with motor oil before installing it into the sprocket spacer. 19- Next, I slid the sprocket spacer on to the countershaft with a twisting motion. I pushed it all the way in with my fingers until I could feel it bottom out against the countershaft bearing seal. Now, it was time to leak test my work! 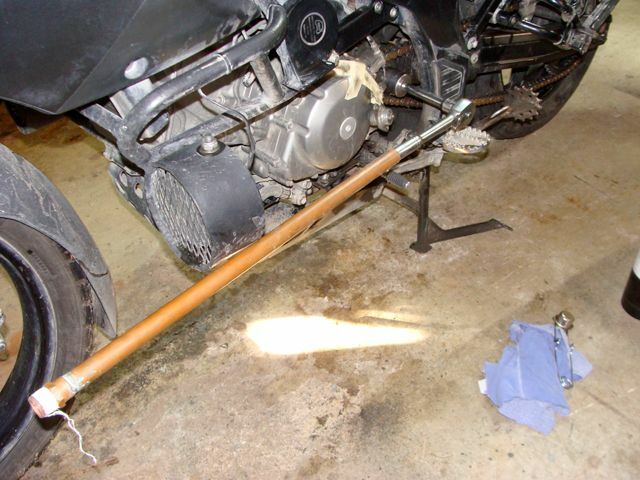 20- I slid the clutch push rod into place. 21- With the bike in neutral, I started the motor. 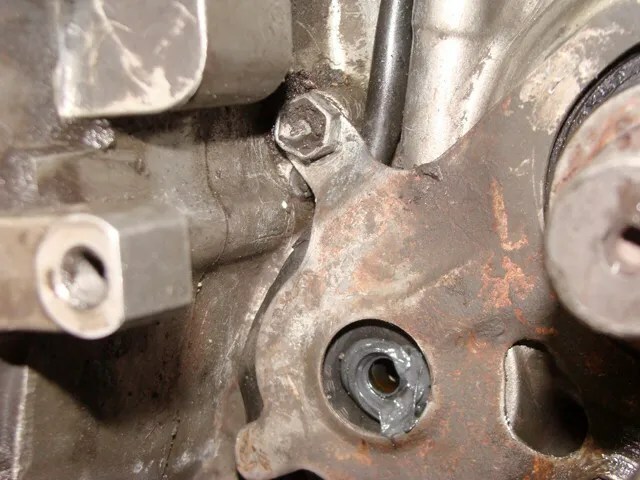 Even though the countershaft nut isn’t in place and the clutch release mechanism isn’t installed, there shouldn’t be any leaks out of either seal. I shifted through some gears, (Yes, you can use your gear shift lever without your clutch. ), and I gave the bike some throttle. I shifted through gears and revved the motor to put some pressure on the seals. I was satisfied that there weren’t any leaks. It was time to button things up. Placed the transmission in neutral, and I shut the bike off. 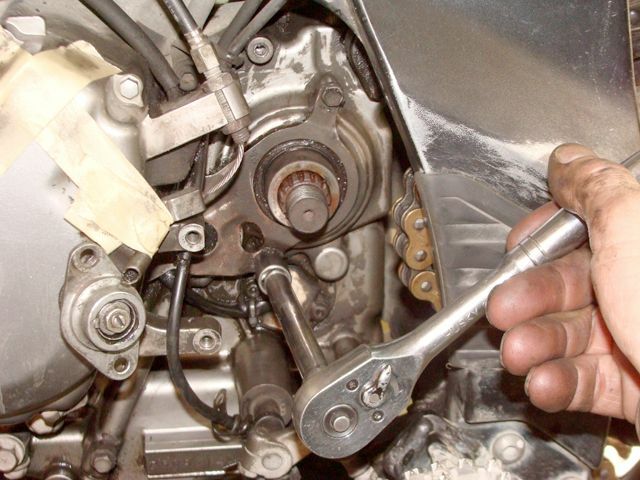 22- To give myself some working room, I removed the clutch push rod. Some motor oil dribbled out of the push rod hole, due to the motor being warmed up during my leak test. I wiped it up with a rag. 23- I installed the seal retainer plate. I had so much trouble trying to get the difficult bolt back into its hole that, I ground a slot for a screwdriver into its head with my Dremel tool. 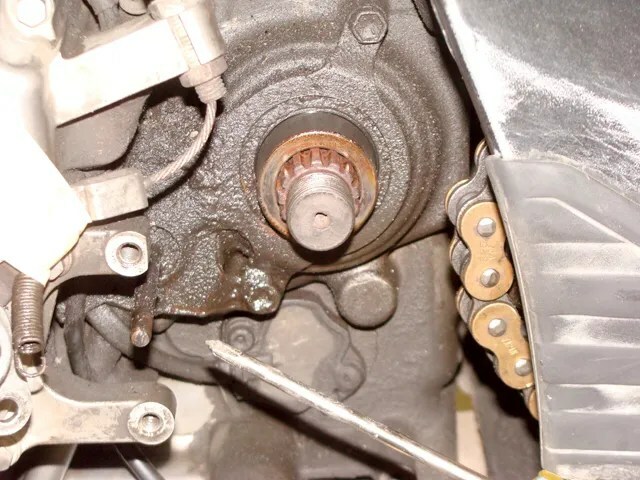 24- When I installed the retainer plate, I remembered to place the gear indicator wire lead behind the “ear” of the plate. The kickstand safety switch wire went over the plate. 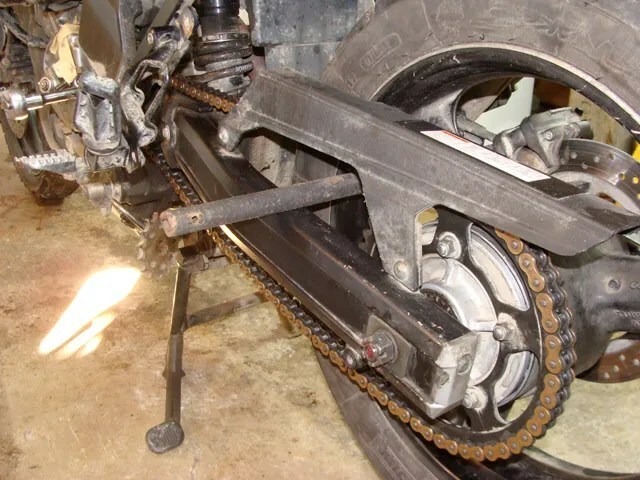 25- Next, I slid the countersprocket and chain back on to the countershaft. 26- I added the locking washer, (I used a new washer due to the several times I have removed the OEM washer for sprocket changes.). 27- Then I squirted some “blue” thread-locker on to the threads of the countershaft, then screwed the nut on. 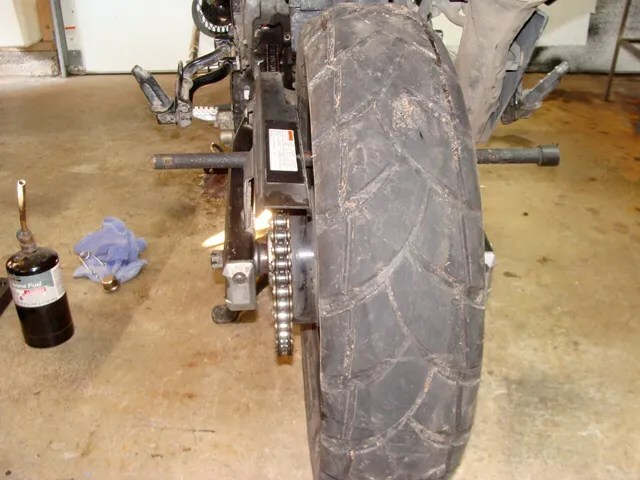 28- I removed the metal tubing from on top of the swingarm, and slid it underneath the swingarm,then back through the rear wheel. I rotated the rear wheel so that a spoke fetched up against the metal tube. 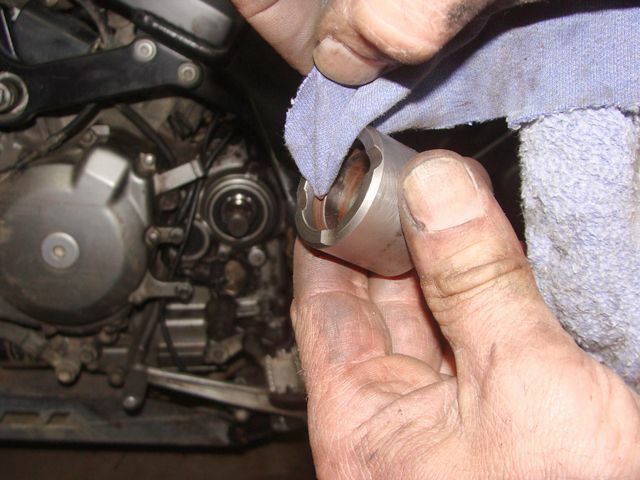 29- I used my torque wrench to tighten the countersprocket nut to a value of, 105ft-lbs. 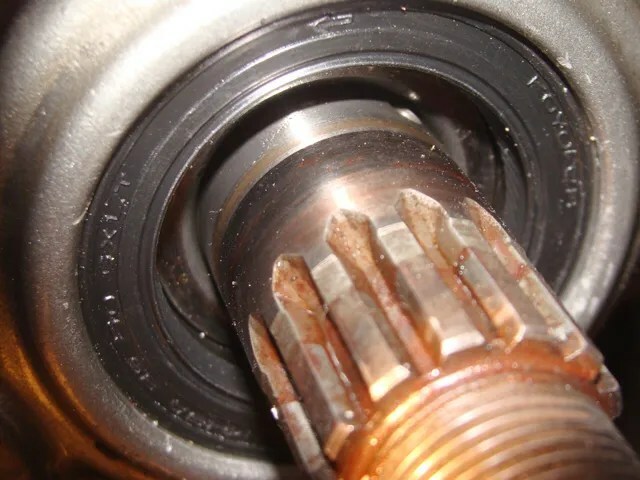 30- Using a hammer, and a flat-blade screwdriver, rebent the countershaft washer down on to the countershaft nut to lock it into place. 31- Next, I adjusted the chain to the tension that I like, and I tightened up the rear axle bolt. 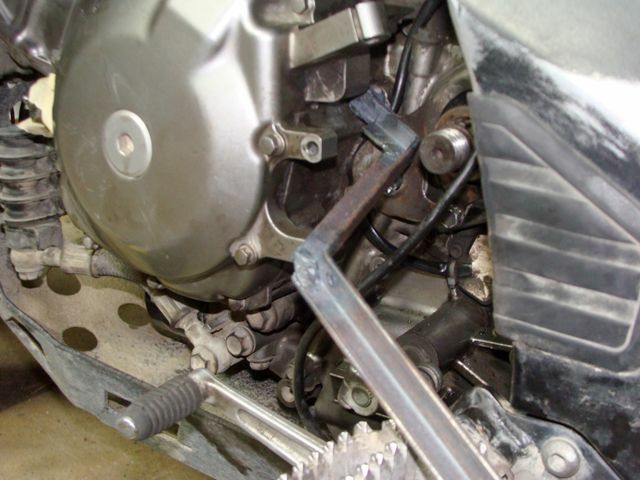 32- Then, I slid the clutch cable back into its bracket and tightened up the locking nut. Here are some photographs of the old clutch release mechanism. And, the inside of it, with the ball bearings missing. When I mounted up the new clutch release, I had to set the proper clutch adjustment for the mechanism. Before bolting the new release mechanism into place, I loosened the lock nut, and backed off the adjusting screw. 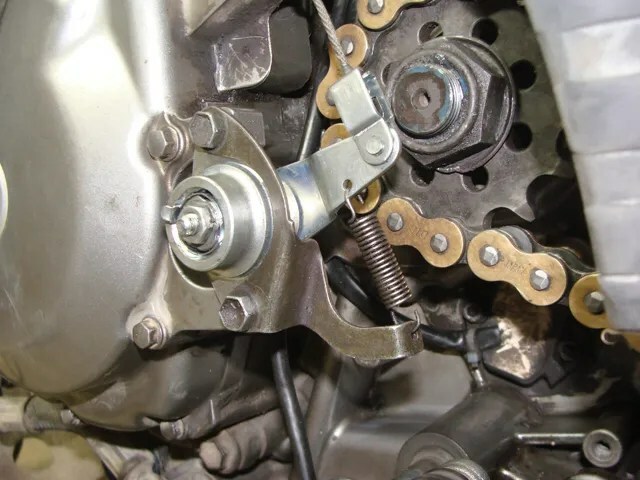 Once the release was mounted into place, I tightened the adjusting screw until it bottomed out on the clutch push rod, and then I backed the screw off 1/4 turn and tightened the lock nut. (This adjustment is per the Suzuki Service Manual.). I had to make cable adjustments once I had reassembled all of the clutch related components. 33- I conducted a “leak test” on the bike again. I ran through the gears, and I tested my clutch cable adjustments. No Leaks! But, because I have never done a job like this before, I was concerned that I may have missed something while doing the work. So, I decided to ride my motorcycle around for a couple of days, before installing the sprocket cover. Doing this allowed me to inspect both seal areas, from time to time, to check for leaks. There weren’t any, so after about three days of riding, I reinstalled the sprocket cover.